One of the biggest challenges hairdressers face is hair color correction (for example, taking clients from box red’s to blonde). It’s time consuming and can be expensive. But, getting it right makes it well worth it. This blog is dedicated to the box color girls and women that are in need of a change. Those that are ready to come back to a professional to get the job done right. When done well, color correction can have minimal damage and look great. Recently, my new client Donna was one of these women. 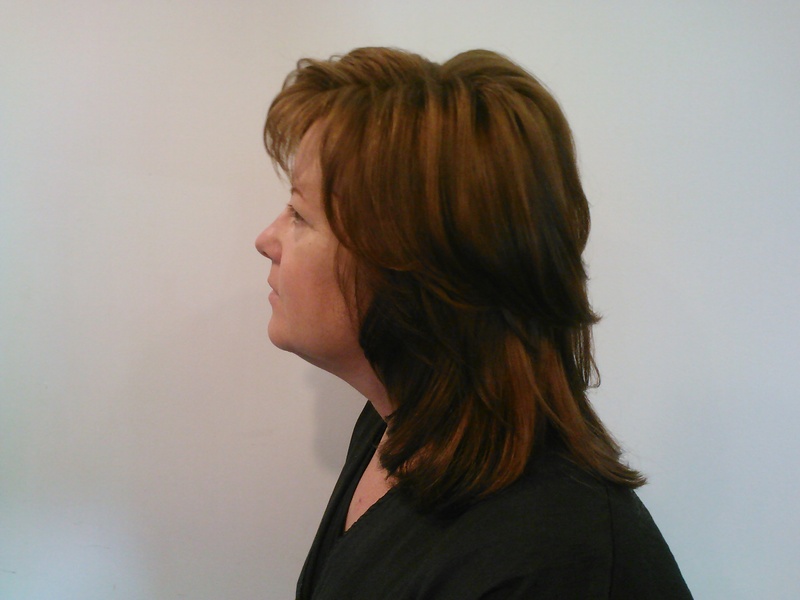 Here’s a photo of Donna from our initial consultation. She explained that she had been a red head for about 10 years. She had been coloring her own hair, using do it yourself cool reds. In addition, she had recently had hair extensions. The nearly black color on the bottom of her hair (shown in the picture), had come from matching the extensions. Although, the extensions where gone, the dark hair color remained. Donna was ready for my help and was willing to go through the necessary steps to become a blonde. She seemed rather knowledgeable on the subject and understood that this would be a process, not just a simple fix. There are many different hair color removers on the market. For Donna, I decided to use Rusk Eliminate. It works great without damage. I followed the package directions mixing steps 1 with 2 and applied and processed it twice. With each application, she spent several minutes under the dryer. I followed those applications with step 3, to make sure the dark red pigment wasn’t coming back. At this point, I was confident that I had achieved the lightest result I could get. 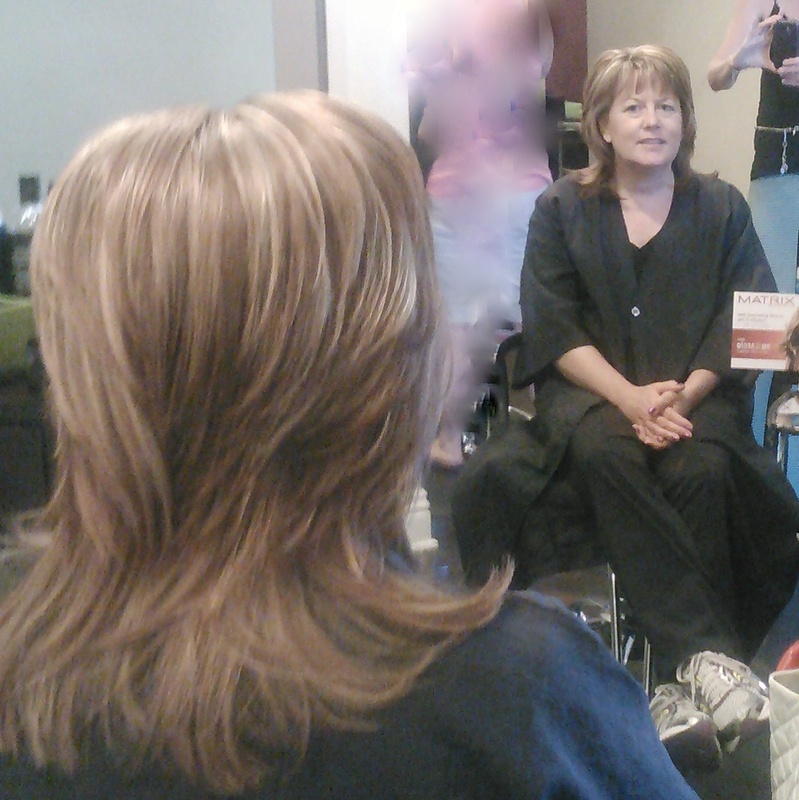 Before and during a hair color correction, there are many choices that the client and hairdresser make together. We could have taken this correction in many different directions. One approach would have been to simply highlight over the brassy orange hair that I’d achieved after using Rusk Eliminate. Doing this would have resulted in a warm blonde hair color. This approach can also be quite beautiful depending on the skin tone of the client. However, I explained to Donna that she would need to give her hair a rest for about a week before we could continue. She decided that she would rather be a neutral to warm shade of brown, than to live with the brassy result for a week. In addition, in the end, Donna wanted to have a more neutral blonde hair color, rather than a warm blonde. 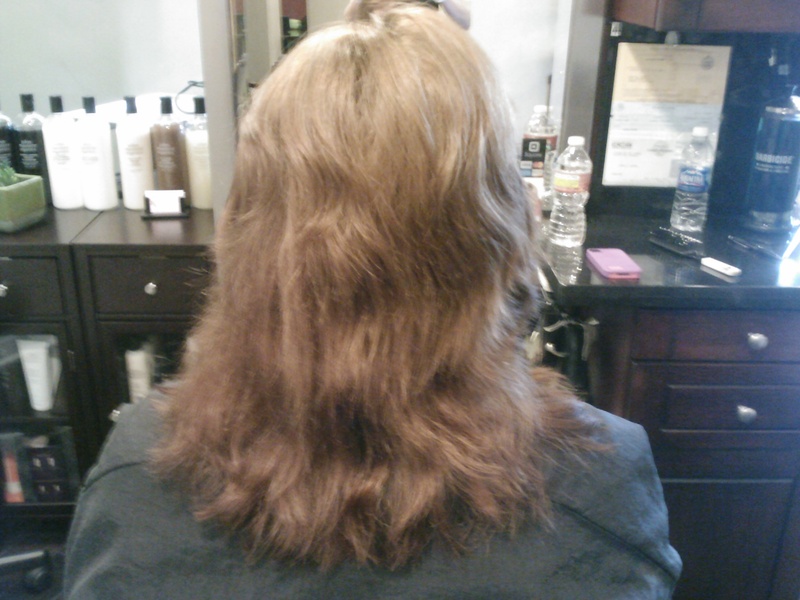 I advised Donna to give herself a couple of really good deep conditioning treatments before our next appointment. This would be in preparation for the highlighting service the next time I saw her. This is what Donna’s hair looked like when she returned to me the following weekend. As you can see during the week that Donna was conditioning and waiting for her next appointment, the neutral brown shade that I had put on her faded to a great base from which to start my highlight. At this point, I did a traditional bleach weave on Donna with foils. The result was a beautiful neutral blonde with very little warmth. I spoke to Donna the other day. She’s almost ready to come back in for her first regrowth touch up. She understands that for her, being a blonde requires maintenance. She has continued to give herself deep conditioning treatments. I had advised her that Joico’s K Pak Reconstructor is an excellent deep conditioner for these types of situations. When I see Donna next, we’ll decide what route is best . Some of the brass will have come back and I know she still wants to be even blonder. There will be choices to make and budgets to consider. But I’ll be there for her, to help her hair color dreams come true.